Hello all, I recently was given a strange task. An office needs to have everyone in there office on different vlans. The reason for this is that each user is developing software and they need to test VIA wireless to other wireless devices. Lots and Lots of broadcast, as well as different subnets. So, how can we separate each of these users wirelessly and give each of them their own “play space”? You can accomplish this a couple ways: We can have 100 different WLANs, each with their own Vlans, or use 1 SSID and use Dynamic Vlans to separate them out. The tools I will be using are – Ruckus Wireless Zondirector, and APs, Microsoft NPS, and Wireshark to take a better look at what is happening at the packet level. So first lets setup everything. 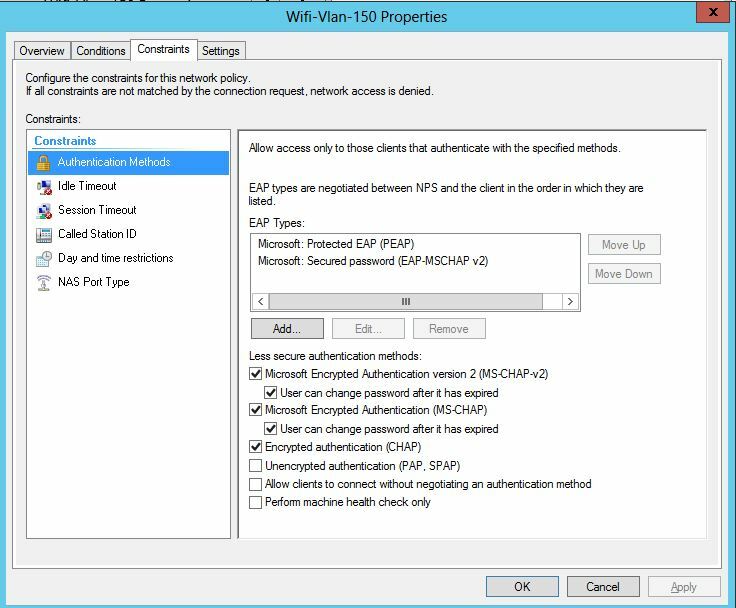 We need to use 802.1x authentication for WLAN Access. I will not walk through all the steps here but definitely do another blog entry on setting that up. So lets assume as of now we have 802.1x working great for authentication. Our next step is that we need to create new Security Groups in AD and add our users to them. 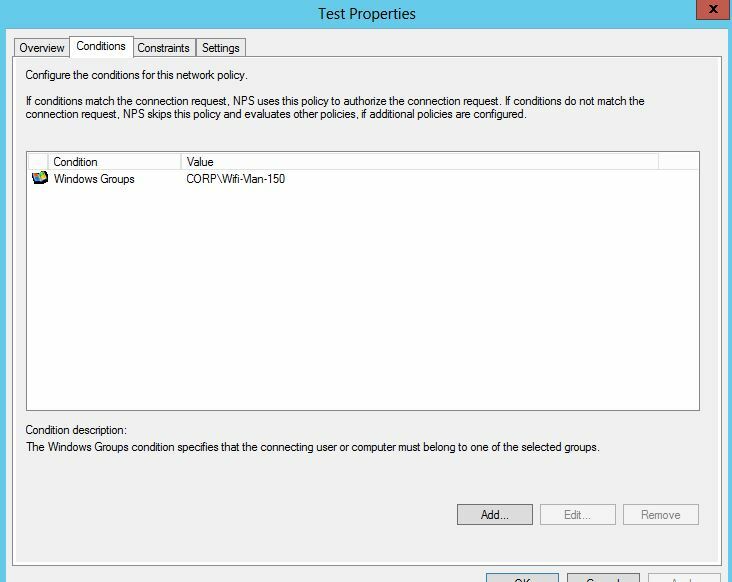 I added groups that reflected the Vlan name. 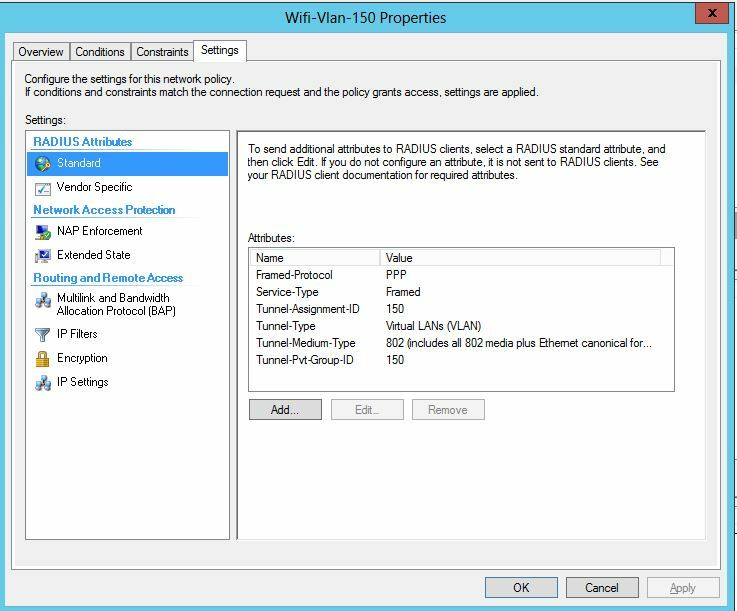 For example WIFI-VLan-150 and then added my user I want to get VLAN 150 to. Next lets create our Radius Policies. Next the magic happens – we have to add in our Radius attributes . These are Standard radius attributes. We will add 4 802.1x attributes. 1. Tunnel-Assignment-ID – String – Vlan ID. 4. Tunnel-Pvt-Group-ID – Value – String – Vlan ID. 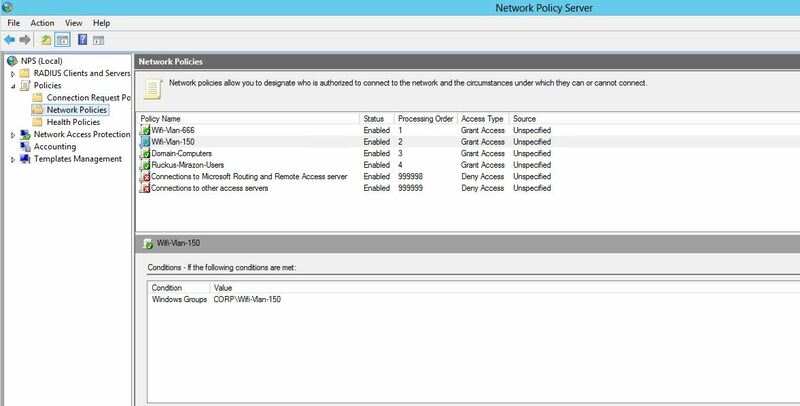 Note – I did not add this at first, this attribute is what fixed my issue, and successfully pushed the Vlan ID to my client. Make sure this policy is above your default policies. The next screen shot shows my order of policies. Notice I have one for 666 vlan, and 150. Then there is a domain computer, then a catch all for domain users. That’s it for Radius, now we need to create the WLAN for in Ruckus for our Dynamic Vlans. Remember, we are assuming everything works great with Radius authentication from the get go. 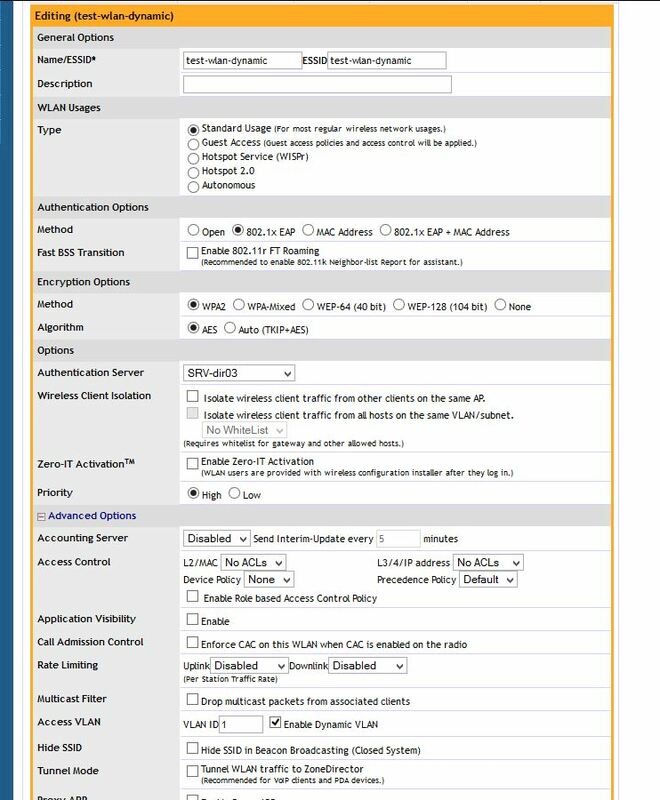 The main thing when creating the WLAN in Ruckus is to use 802.1x for authentication, and then under “Advanced” check the “Dynamic Vlan” box. You will notice I am using “SRV-dir03” For authentication (My Radius Server). Apply this and we should be golden.